Home > Sources > Periodicals > "On Track"
The US bi-weekly publication "On Track" appeared early in 1981, shortly after Racecar magazine vanished. Its coverage of Can-Am, Formula Atlantic, FSV and other forms of road racing was by far the best available during the 1980s. 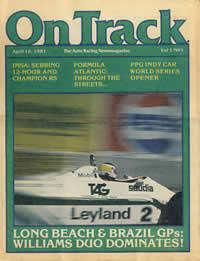 Thanks to a number of very generous donations, OldRacingCars.com now has a complete collection from the start of publication in April 1981 to the end of 1995. Vol 2, No 21 November 4, 1982 Copies of relevant sections provided by Bob Micheletti. Full copy on its way from Bob Micheletti. This list was last updated on 14 July, 2016 .